The Classic of Tea or Tea Classic (t=茶經 s=茶经) is the very first monograph on tea in the world, written by Chinese writer Lu Yu between 760 CE and 780 CE during the Tang Dynasty. According to Tea Lore, Lu Yu was an orphan of Jinling county (now Tianmen county in Hubei province) who was adopted by a Buddhist monk of the Dragon Cloud Monastery. He refused to take up the monastic robes and was assigned menial jobs by his stepfather. Lu Yu ran away and joined the circus as a clown. At age 14, Lu Yu was discovered by the local governor Li Qiwu who offered Lu Yu the use of his library and the opportunity to study with a teacher. During the An Lushan and Shi Siming rebellion period, Lu Yu retired to Shaoqi (now Wuxing county, Zhejiang). During this period, Lu Yu made friends with many literati, including the calligrapher Yan Zhenqing and the poet Huang Pu Zheng and wrote his masterpiece: Ch'a Ching. For Lu Yu, tea symbolized the harmony and mysterious unity of the Universe. "He invested the Ch'a Ching with the concept that dominated the religious thought of his age, whether Buddhist, Taoist, or Confucian: to see in the particular an expression of the universal" (Shapira, et al., 150). Lu Yu's Tea Classic was the earliest treatise on tea in the world. It could be said the most famous work on tea yet at only about 7000 Chinese characters the book is not large. Written in the literary language of the Tang Dynasty, a condensed, refined and poetic style of Chinese. 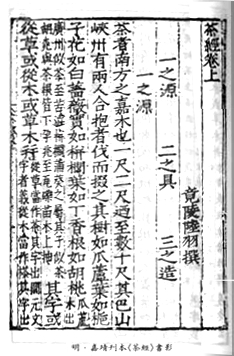 The "Tea Classic" is made of "Three Scrolls Ten Chapters (三卷十章)"; each chapter is briefly explained below. This chapter expounds the mythological origins of tea in China. It also contains a horticultural description of the tea plant and its proper planting as well as some etymological speculation. The ancient giant tea tree in Bashan Xiachuan area. Features and characteristics of tea tree. The Chinese character "chá" and five other Chinese characters for tea. Characteristics of quality tea leaves, soils and topography compared to tea quality. Benefits of good teas and bad teas. The geographical region, harvest seasons and growing methods in relation to tea quality. This chapter describes fifteen tools for picking, steaming, pressing, drying and storage of tea leaves and cake. Tools for making compressed tea brick, construction and recommended materials, specifications and instructions for these tools. This chapter details the recommended procedures for the production of tea cake. The right time of the day, season and climate for plucking. Drying and storing of collected tea. Texture and features of quality brick tea . Understanding process methods and how to identify quality brick tea. This chapter enumerates the guidelines for the proper preparation of tea. Methods and steps for baking tea brick before brewing, storage of baked tea brick. Types of water and water quality, things to look out for and timing of boiling water. Steps and methods in preparing tea. The brewing methods are designed for tea of the Tang Dynasty. This chapter describes the various properties of tea, the history of tea drinking and the various types of tea known in 8th century China. Reasons for drinking tea, how or when tea drinking started and its progress through the Tang Dynasty. Various types of tea and their drinking methods. Tea should be drunk pure without adding any ingredients to it, good tea brew should begin with careful preparation from cultivation to brewing. Methods of sharing tea with acquaintance. This chapter ranks the eight tea producing regions in China. Tea producing areas in Tang China, grading and comparison of tea quality from these areas. This chapter lists those procedures that may be omitted and under what circumstances. Tools and methods that can be excluded in cultivation and processing under abnormal conditions. Tea utensils and brewing methods that can be simplified or improvised under various outdoor and unusual habitat environments. This page was last modified on 7 October 2013, at 05:13.